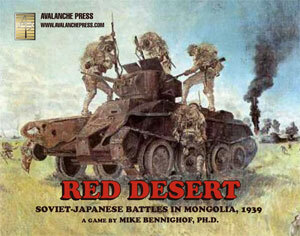 In the late spring of 1939, Japanese and Soviet armies skirmished over an insignificant piece of ground along the Khalkin-Gol River, on the border between the Soviet client state of Mongolia and Japan's puppet empire of Manchuria. Both sides threw in more and more troops until by late August, each had committed entire armies. By the time a cease-fire took effect in mid-September, the Soviets had lost over 17,000 men and the Japanese a staggering 45,000, over half of those committed. Red Desert portrays these battles at a scale of two kilometers per hex. Units are mostly battalions, with some companies and small regiments. Units are rated for attack, defense, movement, morale and armor strength; artillery units can provide offensive or defensive support.